Dr. Schilling, one of the world’s leading experts on innovation, joins us in-studio to share the science behind the traits, and quirks, that increase the likelihood of success in breakthrough innovation. We learn about the commonalities of some of the greatest breakthrough innovators – from Albert Einstein to Steve Jobs to Elon Musk, and what it is about them that’s different than a typical innovator…and what patterns they have in common. Dr. Melissa Schilling, one of the world's leading experts on innovation, joined Deidre and JG in the GutwiZdom studio to discuss how true innovation – and the ability to innovate again and again – comes from allowing your personal, social, and emotional quirkiness to break through. Dr. Schilling is the John Herzog Family professor of management and organizations at New York University's Stern School of Business, and one of the world's leading experts on innovation. Her latest book, Quirky, explores the themes we discussed in this episode. She has also authored the textbook, Strategic Management of Technological Innovation (now in its fifth edition) and coauthored of Strategic Management: An Integrated Approach (now in its 12th edition). Be independent: Don’t worry about your thoughts seeming “normal.” If you allow yourself to think differently than others, you may find yourself thinking more innovative thoughts. Be open to new experiences and ideas: Allow yourself to feel uncomfortable, since this is how you stretch your experiences, take in new ideas, and come up with your own innovative ideas. Follow through: The best ideas are nothing without working hard to make things happen. Be idealistic. The best innovators have idealistic goals, and if those goals resonate with others, they will rally around the innovator to help make those goals a reality. Take time be alone: Your best ideas may come when you spend time alone to think. This also goes for children; don’t be afraid to let children spend un-structured time and to be alone – without technology/screens. Brainstorming groups don’t work: Let employees work on their own to come up with innovative ideas. Then, bring them together to share their ideas. Motivate with idealism: Your employees will respond better to big, idealistic goals rather than goals that result in cash rewards. LISTENERS: Are you an innovator? Are you quirky? 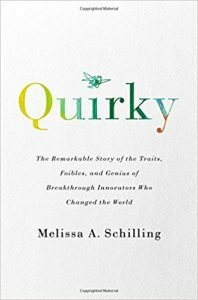 Do your quirks help you to innovate? Share your experiences and “wiZdoms” with us! Either leave us a voicemail at 646-653-9278 or send us an email. We may talk about it - or we may even talk with YOU - on the air!